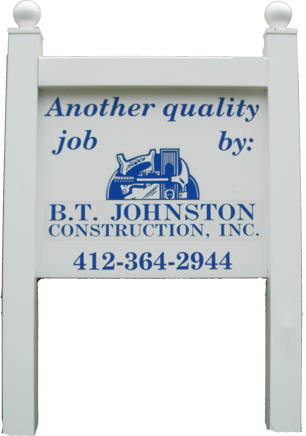 About B. T. Johnston, Inc.
B. T. Johnston Construction, Inc. was incorporated in 1994. It is a six time award winning company with four First Place Awards in Exterior Home Improvements for various Room Additions, and a First Place for Specialty Improvements Award for a porch addition. Specializing in Additions to residential Homes, we also do garages, kitchens and baths, game rooms, window and door replacements, decks, and other phases of construction. Brian T. Johnston is the president and owner of B. T. Johnston Construction, Inc. He is the second generation in his family to be in the construction business, thereby developing an interest in construction at an early age. Brian began his formal training as an apprentice carpenter in 1974 and attended classes and working as an apprentice until receiving a Journeyman certificate from the United Brotherhood of Carpenters in 1978. Work in various phases of the commercial and residential construction business followed until 1984. Brian then began his own company with its primary focus on residential construction. Committed to ongoing education in the construction industry, Brian became a Certified Remodeler with the National Association of The Remodeling Industry (NARI) in 1994. Certification with NARI requires classes, study and extensive testing in all phases of Remodeling. Code Plus, an association dedicated to doing work to exceed building codes quality and Lead Safe Remodeling are two more of the educational involvements Brian has made demonstrating a level of concern for doing safe quality work. B. T. Johnston Construction, Inc. is also a member of the following organizations: Better Business Bureau, National Association of the Remodeling Industry (NARI), and the North Suburban Builders Association. We are fully insured. Our State Registration Number is PA17566.